Happy Friday, everyone! Things have been a little heavy on the blog this week, huh? Well, let’s lighten it up a bit, shall we? Yesterday, Jax and I got to meet 4 preemie moms and their kids at the park! It was amazing being in a group of women who just “got it.” Everyone shared stories and asked questions without any judgement. They understood what I meant when I said “The first birthday wasn’t so great.” I’m so thankful for our MN Preemie Parent Facebook group because without that group, I wouldn’t have met any of them. And the KIDS! Talk about an amazing group of little ones. Owen, RE, Jax, Aidyn, and Xander were all preemies. (Hayden was camera shy, but she was the “big kid” of the group at 3 years old!) Everyone spent considerable time in the NICU. Everyone has had at least 1 surgery, many have had 5. Heart surgery. Brain surgery. Eye surgery. Stomach and intestines surgery. I could go on… One of the moms did the math: The combined birth weight of all five kids in this picture is 10 lbs 4 oz. Many of these kids were given small chances of survival. And now, 12 – 15 months later, I’d say they are doing more than just surviving! Jax, RE, Aidyn, Owen, and Xander taking a dip. Check out the stroller parking! I love how all the boys are lined up on the shore and RE is rocking it in the “deep end!” RE, Aidyn, Owen, and Xander were all at Amplatz hospital together! Jax is the lone Children’s kid, but he didn’t seem to mind! Love that you have someone (s) that get it. Parenting is hard enough much less with all the added stuff jax’s situation adds to it. I am glad that you have someone that is going through similar situations to support your journey. 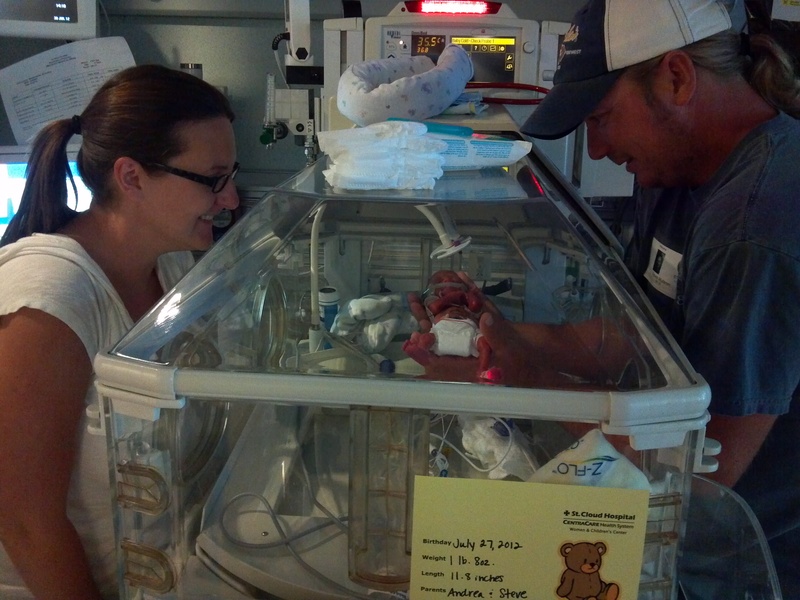 Previous Previous post: Pumping in the NICU: Liquid Gold or Liquid Guilt?